Is Enbridge Stock a Good Buy at $47? Canadian pipeline company Enbridge is currently trading at around $47 per share. But based on Benjamin Graham’s formula for valuing stocks, which I’ve discussed before, the fair market value of Enbridge should be around $62. $62 per share is in line with what most analysts have determined as well. 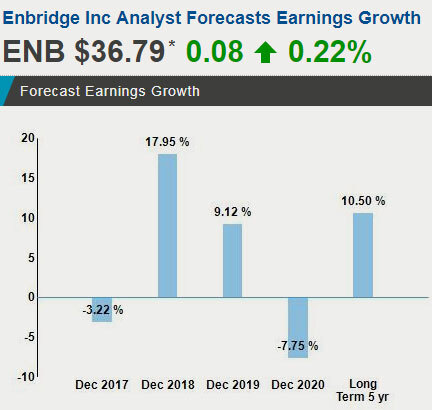 For example TD Equity Research recently posted a 12 month target of $62 for Enbridge. Here is the full research paper for anyone interested. If Enbridge climbs to $62 per share that would be a 37% increase in total return. That’s pretty darn good! 😀 This is why I believe Enbridge is potentially oversold right now and is a good buy. 😀 Over the past decade ENB dividends have increased by 10% annually. Enbridge plans to continue growing its dividends by at least 10% every year through 2024.